Tai Chi Chuan (translated supreme ultimate boxing) is one of the finest products of Chinese philosophy and culture. Tai Chi is based on the principles of I Ching (Book of Changes) and the philosophy of Yin and Yang which means we must maintain a balanced way of life. Tai Chi is an internal exercise program which consists of slow, relaxed, flowing balanced movements. In China, millions of people practice Tai Chi everyday to obtain relaxation, increase concentration, improve overall health and to tone the body. Tai Chi exercises the cardio-vascular system by increasing the circulation of blood and oxygen to all parts of the body. The combination of turning, stretching and twisting movements work to release tension and allows every part of the body to be exercised without strain. Concentration, coordination, flexibility and balance will improve over a period of time and many degenerative and stress related conditions are relieved by practicing Tai Chi daily. The ability of Tai Chi to rejuvenate rather than exhaust, makes it a valuable exercise program in our active and fast paced society. Kung fu is for everyone! There is no age limitation as kung fu is ideal for any individual to keep in shape both physically as well as mentally. The system taught here is the Wah Lum Tam Tui Northern Praying Mantis style of kung fu. A skillful martial artist, Lee Kwan Shan combined his family style “Tam Tui” (a style which emphasizes strong leg movements) with the Wah Lum Praying Mantis to form a well rounded and effective system. All students will learn basic exercises that will help to improve your overall physical condition. Within weeks, students will feel a definite improvement in their well being. An obvious benefit of martial arts is the ability to defend oneself from physical aggression. Many practical and effective self defense techniques are taught. Again, improvement in speed, strength, skill and reflex will be evident after several months of intensive training in self defense techniques. Hand forms are based on the Northern Chinese long fist forms which are strong, fast and long in reach with the influence of the deadly mantis hook hand. Hand forms are essential for building strength, speed, stamina and precision. A characteristic feature of Chinese kung fu is the use of many weapons and this style incorporates the use of several different types of weapons. Weapons are taught after the student has learnt basic exercises and forms. Sparring is an optional part of the curriculum. A student will strive to develop their fighting capabilities at the same time developing endurance, strength, body conditioning, speed and reaction time. Students are permitted to join sparring after their first test. Students will benefit from the strengthening of body and mind that results from participating in kung fu classes. Kung fu is also an ideal exercise program for those who are interested in maintaining or losing weight. Pee Wee class at the Wah Lum Temple is an introductory course to initiate and to familiarize your child into the martial arts world. At this age, it is important for Pee Wees to learn co-ordination and flexibility, to build confidence, and develop skills. Kung fu is ideal for boys and girls of all ages. By preoccupying your child with an enjoyable art, they can learn skills to increase their abilities both mentally and physically. This program is ideal to keep your child in an environment where he/she is among friends with positive interests and attitudes. The children’s program will take the child through the Wah Lum Curriculum at a pace best suited for the child. They will learn traditional hand forms, weaponry, drills, self-defense, and philosophy. Wah Lum Kung Fu will develop your child’s flexibility, coordination, confidence levels, and increase their speed, stamina, and strength. Overall your child will be better prepared physically for the challenges of daily life. Our self-defense course is simple and geared towards children. The classes are exciting, educational, and fun. Overall your child will be better prepared physically for the challenges of daily life. To martial arts practitioners around the world, Grandmaster Chan Pui (Chan) is known for many things, such as being sixth generation of the Wah Lum Kung Fu System, 33rd generation disciple of the Shaolin Temple, and being a pioneer in traditional martial arts in the United States. To his students, Grandmaster Pui Chan is known for his dedication to his system, pride in his students, enthusiasm in training and teaching, and sincere respect for martial artists. Those who know Grandmaster Chan know him to be a powerful practitioner, an astounding performer, an honorable man, and a true friend. Chan was first introduced to martial arts at the age of 6, when his father took him to Grandmaster Lee Kwan Shan, in hopes of improving Chan’s physical health and strength. 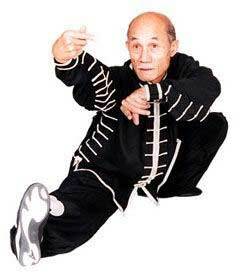 Grandmaster Lee Kwan Shan, the fifth generation disciple of the Wah Lum System, had formed a system combining techniques from the Wah Lum Monastery with those of his own family’s Tam Tui (seeking leg) system. After testing Chan’s flexibility and ability to learn basic exercises, Grandmaster Lee Kwan Shan accepted Chan as a student, and he started intense training in the Wah Lum Tam Tui Northern Praying Mantis style. When Chan was 9, Communists imprisoned his parents, and had to leave school and go to work. While working and continuing his kung fu training, he taught himself to read Chinese, and learned at this early age to persevere through hardships. After becoming an accomplished martial artist, Chan escaped from China to Hong Kong, and from Hong Kong, set sail for America with no money, but with courage, ambition, and a dream. After arriving in Boston, Massachusetts, in 1968, Chan took a job as a cook, and learned to speak and write English. He started performing lion dances for Chinese New Year celebrations in Boston’s Chinatown, and soon started teaching kung fu at the Bamboo Hut Sports Association. In 1970, he opened his first school, becoming one of the leading pioneers in introducing martial arts to the United States. From the start, Chan emulated the traditional teaching style from Grandmaster Lee Kwan Shan, stressing good basics for a strong foundation. Chan’s school flourished, and he became well known and highly regarded in both the Chinese and English communities in Boston. Then Chan’s dream grew; he wanted to build an authentic Chinese kung fu temple, with the potential to house live-in students and provide a well-rounded training environment. In 1980, when Chan decided to move his family to Orlando, Florida, he realized this dream, and seized the opportunity to build what he envisioned. The new headquarters of the system, referred to as the Wah Lum Temple, boasts a simple yet beautiful garden surrounding outdoor training areas, which encase the indoor training room. Bamboo plants grow around tall posts used for training balance, and a charming, intricate waterfall pond is home to Chinese Koi Carp. This peaceful setting is used for traditional and professional live-in students of both kung fu and tai chi. A dormitory is available for professional live-in students, many of whom travel from around the world to experience training with the Wah Lum System. Since then, pupils of Grandmaster Chan Pui have opened schools around the world, under the Wah Lum name, now totaling more than 30. Much more than just a business, this training system continues Chan’s dream to encourage dedicated martial artists to share the Wah Lum philosophy and training to achieve maximum potential in the art. In addition to sharing Wah Lum training philosophy, Chan established and maintained a strong rapport with various organizations, martial arts systems, and other respected colleagues. Chan holds strong kinship with numerous martial arts systems and organizations, and supports and is honored at many tournaments and events in the United States and China. It was through a relationship with the Shaolin Temple in China that Chan coordinated the introduction of the Shaolin Monks martial arts performance team to the United States in 1992. Chan often invites instructors from other systems to teach a seminar or train a class, to share different styles with his students, to help them understand and appreciate different techniques and applications. When more kung fu organizations and schools were being formed in the United States, Grandmaster Chan and Grandmaster Wai Hong founded the United Kung Fu Federation of North America, to ensure the standardization and qualification of traditional martial arts schools, and establish an affiliation amongst martial arts schools for competition and other organized events. 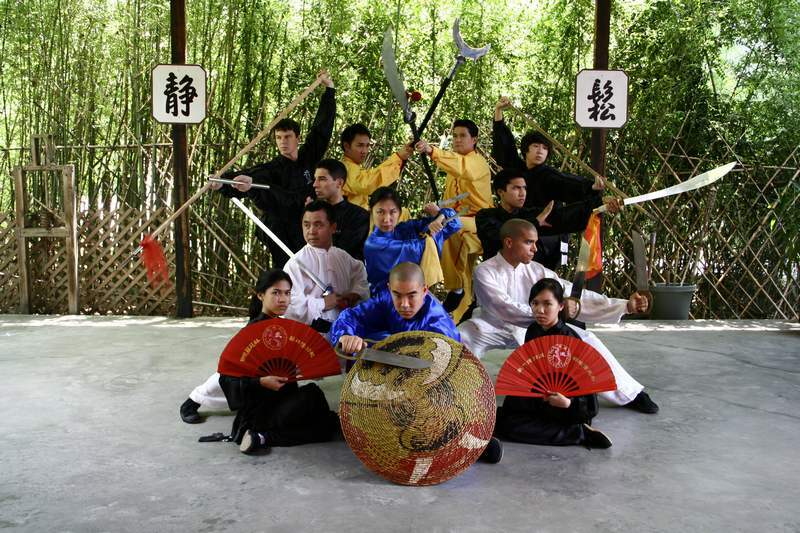 Chan started arranging through his wife’s travel agency (branched from the Wah Lum Temple) means for his students to travel to China with him, where they would visit the Shaolin Temple, get a firsthand glimpse of authentic Chinese and martial arts philosophies and culture, and test their martial arts technique and performance in international competitions. Grandmaster Chan continues to motivate his students’ training by offering seminars on forms that are not within the normal curriculum and workshops on techniques and applications. To nurture fellowship among the schools within the Wah Lum System, Grandmaster Chan hosts an internal (Wah Lum) biannual tournament. At this time, students from all Wah Lum schools travel to the Orlando location to compete against each other, providing healthy competition among kung fu brothers and sisters, and spreading spirit, inspiration, and camaraderie within the family system. Profits from all tournaments and events hosted by Wah Lum are donated to the St. Jude Children’s Research Hospital (more than $20,000 to date), to support their care and research of cancer patients and terminally ill children. Grandmaster Chan has been featured in magazines and documentaries for his revered style and prowess in the martial arts industry. Some of his features include the Discovery Channel’s Secret of the Warrior’s Power, Living Legends of Kung Fu (Vol. I), Warrior Within – Inside the Martial Arts, and various interviews and articles with KungFu Magazine, Inside Kung Fu, and Journal of Chinese Martial Arts. Grandmaster Chan has also received honors such as Instructor of the Year and Martial Artist of the Year by Inside Kung Fu Magazine and Black Belt Magazine. And he is a 2003 inductee to Martial Info’s Martial Arts Hall of Fame. Grandmaster Lee Kwan Shan was the founder of Shan Tung Wah Lum Tam Tui Kung Fu System. Since his death 50 some years ago, his disciple Chan Pui spread his style of martial art to various parts of United States and opened more than 30 Wah Lum Kung Fu schools. Grandmaster Lee Kwan Shan (Lee) was born in Shan Tung Province Ping Dou Municipal. He loved to practice kung fu as his family was in the bodyguard business. When he was about 20 years old, he was sent to the famous Wah Lum Temple, where the Boxer rebels settled as monks, and were known to be excellent martial artists. Lee studied for 5 years. On a trip back home, Lee tried to settle a dispute between his kung fu brothers and some village bullies, and he accidentally killed a bully. Subsequently, he had to flee home and took refuge in the south. He went to Kwan Tung Province and visited the town of Sha Cheng twice. In his last visit in the summer of 1948, Lee got sick and died. Because Lee’s students were numerous and spread out, it took three days to complete the memorial service. Hundreds of his students attended his funeral and mourned the death of a great kung fu master. Lee was buried atop Sha Cheng Wan Lam Mountain. The story of Grandmaster Lee Kwan Shan and Chan Pui dated back to the year of 1945. At the time, Chan’s oldest cousin Sin Ying Dang was an acquaintance of Lee and invited Lee to stay in his house at Sha Cheng. Every evening after dinner, Lee and Sin would drop by the Yu Hing Social Club next door. Though Lee was already in his 70s, the village elders urged him to stay and teach kung fu. Lee was overwhelmed by the enthusiasm. Despite of his old age, he decided to start a kung fu school there, but requested Sin Ying Dang as his assistant. In 1946, Chan’s fifth cousin Sin Ying Tim, formally inducted 6 year old Chan Pui, Chan Wan Ching, and several others into Lee’s kung fu school. Of course, this arrangement was very convenient to Chan who lived next door to Yu Hing Social Club and Chung Sin Tong. Chan’s father, Chan Hin Man, was the president of Yu Hing Social Club, noticed that his son was very active and thought learning kung fu would be good for him. He took Chan Pui to meet Lee. Lee took a look at Chan, stroked his head, then asked him to bend down and touch his toes. Pleased with Chan, he took him as his student. In the beginning, it was all learning the kung fu basics. The children practiced at noon and the adults in the evening, under the light of the gas lamp. Chan recalled one of the evening practices when Lee demonstrated the technique of Tam Hou Tui (high toe kick). His kick was so powerful that just the wind of the kick was strong enough to blow out the gas lamp. Lee also impressed many others with his Iron Arm technique. With a strike of his arm, he could split a granite slab into two. Everybody was fascinated by his inner strength and power. Tragedy hit in 1948, in between April and May, when Lee was 80. He was stricken with severe food poisoning and died. Sad news spread to thousands of his students and they came from China and Hong Kong for the funeral. The memorial service lasted for three days and thousands mourned the loss of a great teacher. Rumors had it that Lee taught mostly fighting skills in his later years. After his death, the communist liberated China and all his students scattered all over the country. One of his students, Leung Gun, nick named “the Shadow Kick of Kowloon City” had never lost a fight. Grandmaster Lee Kwan Shan Grandmaster Lee Kwan Shan was the founder of Shan Tung Wah Lum Tam Tui Kung Fu System. Since his death 50 some years ago, his disciple Chan Pui spread his style of martial art to various parts of United States and opened more than 30 Wah Lum Kung Fu schools. Grandmaster… Read more.